Customer happiness heroes, customer success agents, customer delightment officers, … all fancy names for crucial roles in today’s leading SaaS organizations. Customer success has gone from a hype to the preferred weapon to speed up onboarding, increase upsell, decrease churn… SaaS companies realize that not only the products but also the way how they serve the customer will make the difference in the end. A customer success strategy has become a distinctive factor to set your company apart from the competition. SaaS companies rely on their recurring business model. A new customer is only profitable if the life-time-value (LTV) is a couple of times higher than the initial acquisition cost (CAC). Moreover, the cost of acquiring a new customer is only break even after a couple of months. Since the acquisition cost of new customers is several times higher than what it costs to retain existing ones, there is a strong economic argument for customer success as well. The ultimate goal of customer success is to help customers realize the value they expect from your product. Customer success agents want to enable desired outcomes for their customers in the shortest and most efficient way. By focussing on customer happiness, the agents try to shorten onboarding time and maximize engagement during the life cycle, hoping these efforts will result in lower churn and more upsell opportunities. 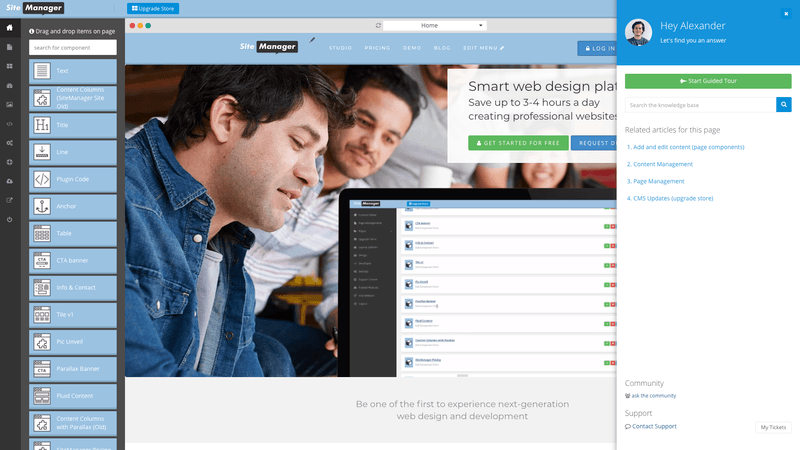 SiteManager is a cloud web design studio, it offers creative and technical users the most time efficient method to build professionals websites. SiteManager is an alternative solution to open source solutions: WordPress, Drupal, Joomla,... just to name a few. Initially, a customer gets impressed by SiteManager because of the overall time-saving aspect of the platform. Since it all started in 2003, WordPress has engaged a big online community to help other users, there is an overload of published online resources for self-learning enthusiasts. If you have an issue or you encounter a bug… for sure you will find your answer online. But … is that the way how people expect to be served today? Timesaving is crucial to sustaining your web design business as a freelancer, studio or agency. Users expect answers to their questions delivered in the most efficient way. This is how SiteManager’s cloud web design studio differentiates from typical open source solutions - timesaving in set-up, production, maintenance, and support. Over the months we realized that users appreciate the way how we respond to their feedback, comments, and questions. They are delighted with how we keep on serving them after onboarding. But good is not good when better is expected… we thought we could take it one step further and that’s why we developed our intelligent help center. It all started with an extended analysis of hundreds of support tickets. We noticed a peak during onboarding phase. Right after the kick off training, users start creating their first website project. Quite normal that new questions arise, most of them rather basic. Often, we can help by just sending a link to our knowledge base or youtube channel. Apparently, it was more convenient for our users to launch a support ticket from inside the platform than searching in our knowledge base. So, there must be a better way... What if we could provide information in the right place at the right time in the platform and serve more efficiently with instant support instead of waiting for a ticket reply? That’s exactly why we build our smart help center. The intelligent engine knows exactly where you are on the platform, will filter the overload of documentation and provide exactly what’s relevant for you. For example, if you are in the plug&play database module you will only see video’s, guided tours and articles related to databases. By launching this new module we want to shift from a reactive to a proactive approach in the coming months. The customer success efforts should focus on value-adding second line support. Guiding customers by giving useful tips and insights in how to use SiteManager the most effective way. We want our customer success agents to act as a personal web design coach, with the ultimate goal to enable the customer’s timesaving expectations. Our smart help center is just a first step in SiteManager’s global customer success strategy. The coming months we will focus on building an in-app community module: SiteManager.CONNECT. We believe that new collaborations could be facilitated from inside technology: connecting with other SiteManager users and adding freelancers to your project in just one click. A new timesaver to flexible scale capacity in your web design business.